* Made of high borosilicate glass, high temperature resistant. * Easy for use, easy for clean. * Using ice or cold water and takes 6~12hours for extraction. * Long time low temperature extraction, can be stored for a long time. * Line shape beautiful, suitable for individual families, but also as a great gift for your friends, relatives. 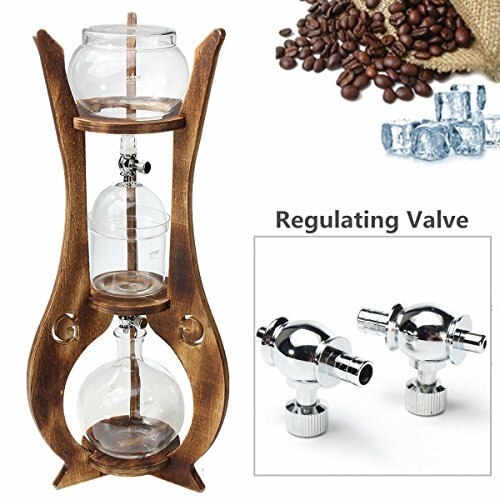 * Make your own unique flavor coffee and taste the wine of coffee. * Producing high quality coffee for your own taste and aroma, enjoy your coffee time. Step 1. Put the stainless steel filter sheet into the middle bottle. Step 2. Pour 40g coffee powder into the middle bottle. Step 3. Use 40mL cold water to soak the coffee powder. Step 4. Cover a layer of filter paper on the coffee powder to make the water droplets more uniform. Step 5. Close the filter valve regulator before pouring water and ice cubes. Step 6. Pour ice cubes and water, the ice water is a total of 400g. Step 7. Adjust the filter regulator valve, can be set to 7 drop every ten seconds. Step 8. Cover the lid. Step 10.Cover the sealed lid, put the coffee pot into refrigerator, cold storage, it can be kept for a week. it can be kept for a week. Made of high borosilicate glass, high temperature resistant. Easy for use, easy for clean. Using ice or cold water and takes 6~12hours for extraction. Long time low temperature extraction, can be stored for a long time. Line shape beautiful, suitable for individual families, but also as a great gift for your friends, relatives. View More In Cold Brew Coffee Makers. If you have any questions about this product by Xiaolanwelc, contact us by completing and submitting the form below. If you are looking for a specif part number, please include it with your message.